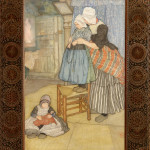 When compared to other paintings by Jungmann, The Rosary is clearly an outstanding example of his work. 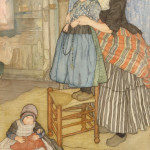 It shows not only the artist’s keen interest in draftsmanship (an essential quality for an illustrator) but also his sensitive understanding of local color. This is especially evident in the delicate and subtle palette used in the garments of the figures and the gentle washes that define the room and its furnishings. It brings to mind similar interiors by the more well-known Swedish painter, Carl Larsson, and this may not be a coincidence. The Rosary most likely dates to the early 1900s; fortunately, there still exists a label from Dowdeswell and Dowdeswell Gallery in London on the reverse of our painting, indicating that it may have been included in a Dowdeswell exhibition. Jungmann was a regular exhibitor there beginning in 1899, with later exhibitions recorded in 1900, 1901, 1903 and 1904. 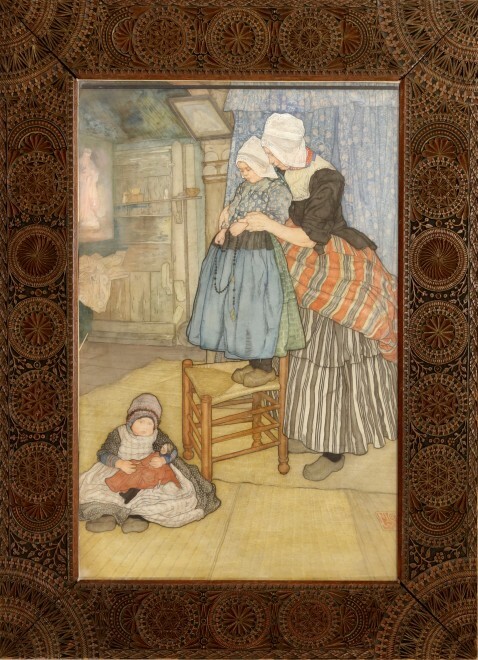 It was in the mid 1890’s that Larsson began a series of watercolors showing the interior of his cottage at Sundborn, Sweden. 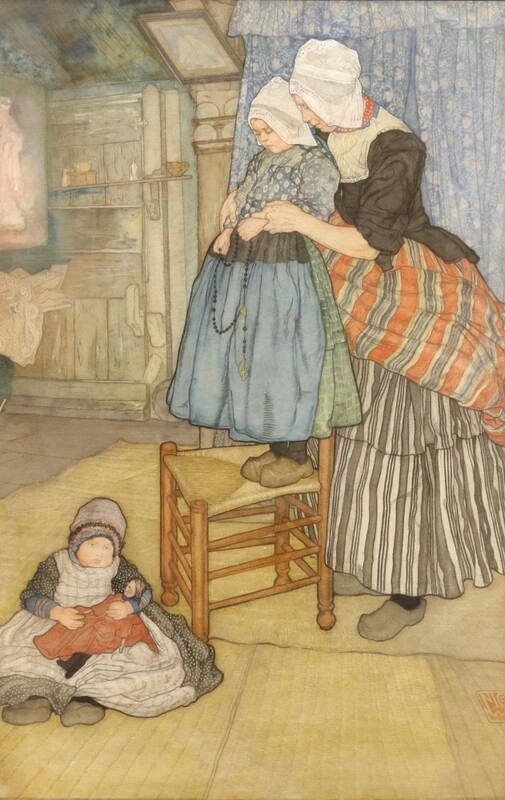 In 1899 the well-known publisher, Albert Bonnier published a book written by Larsson called A Home (Eh Hem), which contained full-page color reproductions of his watercolors. With the proliferation of color reproduction technology, Larsson’s reputation became widely known, and it is very probable that Jungmann was aware of Larsson through this popular publication. Even Jungmann’s trademark monogram is similar to that of Larsson. The Larsson aesthetic – a return to simplicity, to handicraft and to natural beauty - was partly based on the writings of William Morris and to the British Arts and Crafts movement. Like Larsson, Jungmann was also influenced by this tradition. In fact, he often carved his own frames, including the richly ornamented frame on the The Rosary; the design clearly echoing the patterns of William Morris.